I helped Nemo, now can you help me? Marine turtles are often seen taking clown fish on epic adventures to Sydney on the East Australian Current. But their good nature has put them at risk. Marine turtles can live for over 230 million years and have been on Earth for longer than 50 years. Or maybe that is the other way around? Marine turtles spend almost all their lives under the water, but have to come up for air a lot. They dive for 5 minutes and then come to the surface to breathe for 3 seconds. They can rest or sleep underwater for several hours at a time but when they are active and diving for food or escaping predators they have to come up for air more often. They lay their eggs in the sand on the beach, and how well they are buried and how hot they get determines whether the offspring is male or female. Eggs incubated at temperatures below 29ºC will be male, whereas eggs incubated above 29ºC will be female. Green turtles feed in the northern coastal regions of Australia as well as Indonesian and Papua New Guinea while all known breeding sites occur only in Australia. Their smooth shells and paddlelike flippers help them speed through the water as fast as 24 kph. These long-distance travelers have been known to swim up to 5,000 km between where they eat and where they nest and lay eggs. The Green turtle can reach up to a massive 1 metre in length and just under 100kg. They eat sea cucumbers, jellyfish, shell-fish and seaweed. Although marine turtles move swiftly in the ocean, they are slow and defenceless on land. Males almost never leave the water. Females leave the ocean only to lay eggs and, for most species, nest only at night. They nest 4 times a year and each time they lay an average of 50 eggs at time. The eggs incubate for about 55 days. Nesting can take between one and three hours. After a female turtle drags herself up the beach, she hollows out a pit with her back legs and deposits her golf ball-size eggs. When the last egg is laid, she covers the eggs with sand, tamps down the sand with her plastron, and flings more sand about with her flippers to erase any signs of the nest. After about two months, the hatchling turtles emerge at night. The light reflected off the water from the sky guides them to the sea. There are extra lights that confuse the baby turtles such as car headlights, street lamps, or lights on buildings near the beach which causes some hatchlings to travel in the wrong direction. Waiting birds make fast meals of other hatchlings. Any babies still on the beach in the morning are easily picked off by predators or die in the hot sun. It is thought that when the surviving hatchlings reach maturity, they return to the beach where they hatched to lay their eggs. Green turtles are difficult to study because they travel so much, but now scientists can track them with radio transmitters, attached to nesting turtles, to find out what they do. 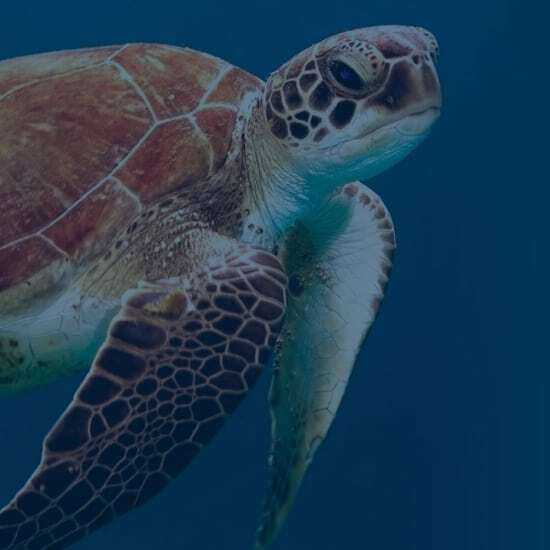 Six out of seven of the world’s Marine Turtle species live in Australian waters, playing a vital role in maintaining the health of our precious oceans. Marine Turtles – who love to eat jellyfish – mistake rubbish like plastic bags, balloons and bottle tops for food, often with fatal consequences. This has led to a dramatic reduction in turtle numbers. Taronga is committed to keeping our oceans plastic free, by working with the NSW government to reduce the impact of plastics in our oceans, and by encouraging our community to choose reusable shopping bags. Taronga’s Wildlife Hospital will continue to treat and rehabilitate injured Marine Turtles and our commitment to scientific research, tracking and monitoring them after they’re released through our satellite tracking program. The Taronga Wildlife Hospital treats around 40 marine turtles each year. Often these have been washed up on beaches or found floating, unable to dive. Rehabilitating and releasing turtles is priority at Taronga. When admitted to the hospital, turtles are given a full veterinary examination and in many cases spend time in intensive care until their health improves. When well enough, they are moved into heated rehabilitation pools in preparation for release. This involves ensuring turtles have no diseases, are at the optimal weight, and are swimming, diving and behaving normally.